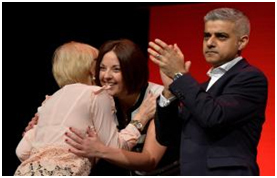 The Mayor of London, Sadiq Khan, addressed the Scottish Labour Party conference to tell them that “seeking to break up the Union will only to fuel harmful divisions caused by the election of the controversial US President and the Brexit Vote.” (1) Khan condemned the SNP plan for a referendum. He claimed that the right response to the Brexit vote was “to build a more United Kingdom”. Surely a better response to Trump and Brexit is for the people of Scotland to remain in a Union with the Germans, French and Spanish and a few more nations too numerous to mention. It is what they voted for in the most recent referendum. What is so important about England that it trumps all other considerations? Khan speaks as an English nationalist. What is best for his nation is best for all. It does not enter his head that Scotland might be better off with Denmark, Ireland and Sweden than remaining in Theresa May’s pro-Trump Brexit Britain. Khan is not the first English chauvinist blinded by his own national arrogance. It is patently untrue that “there is no difference between those who try to divide us on the basis of whether we are English or Scottish and those who try to divide us on the basis of our background (he surely means class), race or religion”. (1) Khan is not the first Englishman to come up with this theory of “no difference” between a bus driver and stock broker or that supporting Scotland or Ireland’s right to self determination is no different from racism, fascism, anti-Semitism and Islamophobia. He certainly won’t be the last. Look no further than Cameron. On the day of the 2014 Scottish referendum result, Cameron stood on the steps of Downing Street to call for ‘English votes for English laws’. Here is one ‘difference’. Scotland has a parliament and England does not. Of course in a federal system there would be an English parliament elected by voters in England. The present constitution is a horrible mess of complexity and confusion, unbalanced by semi-federalism. It cannot last much longer. But this wasn’t a rational discussion on the byzantine complexity of the UK constitution. Cameron was playing the ‘English card’ as a Tory dog whistle for alienated English. He was fanning the embers of resentment against enemies on the other side of Hadrian’s Wall. The theme of Tory chauvinist propaganda is that Scottish people are living the life of Reilly at our generous expense. Of course the Tories love conservative law-abiding Scots but hate the ungrateful Scottish nationalists who, in Khan’s words, are “seeking to break up the Union”. They love workers as much as they hate ‘divisive’ strikers! The EU referendum showed the ‘Prisoners of Mother England’ are angry and some are mad as hell. Some of her prisoners are on drugs and others are into self harm. Many want to kick the crap out of their fellow prisoners. Her Majesty’s prison warders, in charge of the hell hole, have tried desperately to distract them with fake news about immigrants, the European Union, the troublesome Irish and last but not least rebellious Scots. Great English chauvinism is a weapon of the British ruling class. Cameron deployed it in the 2015 general election to finish off Milliband’s version of New Labour. The Tories kept their best weapon for Liberal Democrat voters in the key marginal constituencies. They tested Milliband’s patriotic virility by claiming that a vote for Labour would help the SNP. He was not found wanting. There was no way he would have an alliance with the nationalist SNP. He would rather lose the election than suffer that ignominy. Like fear of immigrants, fear of the SNP caused panic in Labour ranks and persuaded voters in key marginals to back the Tories. It is ironic that Cameron’s anti-Scottish election victory delivered a solid block of fifty SNP MPs, opened the way for Jeremy Corbyn, led the country out of the EU and to the brink of a Scottish exit from the UK. Cameron acted out his ‘Flashman’ role as the upper class opportunistic English chauvinist. It ‘worked’ for him. As Khan has shown, since Brexit it is a card that Desperate Labour is ready to use. But the real problem is closer to home. The left in England is terrified of the English question and guilty of chauvinism by neglect. In that neglect are the seeds of the radical lefts failure to connect with the people.